GAMSAT is more about reasoning and logical understanding of materials presented to you in the test rather than a test-based on complicated pre-learned information. In the first section of GAMSAT you’ll find multiple choice-based questions set from excerpts, from various literary works, as well as graphic presentations of a current situation. This second type is usually an editorial cartoon that you are expected to understand, analyse and answer questions on. What cartoons will you find in GAMSAT? 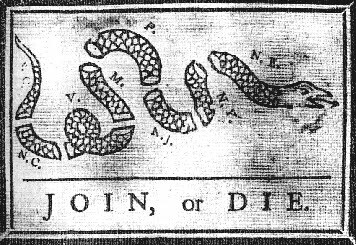 Even if the source of this cartoon is Benjamin Franklin’s call to the American colonies to unite against the British, the essence of the cartoon is still valid today. These cartoons are essentially timeless as they present issues that, while pertinent to their times, also have relevance to modern times. With this cartoon in particular, if you understand the cartoon carefully, it represents a call to unite or perish, and in the present view of the world as well as domestic crises, this comes across as a very potent representation. Symbols: Symbols are commonly used pictures that are meant to represent an accepted idea or group. For example a dove represents peace and a rose might be used to represent untouched beauty. Analogies: These are perhaps the most common and the most important ways to represent a comparison. Cartoonists often use analogies to compare a current situation to a nursery rhyme, fairytale, book or historic event. The first question you may be tempted to ask is “What is the cartoon about?” On a primary viewing you see that this is a barber shop and the barber asks if the man on the chair wants to get rid of the beard. Understand carefully now, and note the use of the word “liberated”. Is the word used to mean anything specific? Why does the cartoonist use this word and not another word like “shave” or “remove”? Also take note that there are others waiting in the shop and one of them reads a newspaper. What does the newspaper say? These cartoons are actually very information dense and are littered with clues. Since GAMSAT is a test of how well you relate information, you are expected to understand this is post-Taliban Afghanistan (note that the shop is called “Kabul” Razors & Shears). So this must be around the time when Taliban fighters were shaving off their beards and trying to escape the Pakistani army offensive, disguised as ordinary men. Understanding such an analogy may not always be easy. This is why our advice to you is to read newspapers everyday and try to understand the editorial cartoons as part of your GAMSAT preparations. You may also go online and analyse cartoons that often come with answer keys.